Ryan Burnett will make his return to the ring at Belfast’s Ulster Hall on May 17. Burnett last fought Nonito Donaire in November last year when he had to retire during the fight because of a back injury. Now the Adam Booth-trained Burnett (19-1, 9 KOs) is straight back into a title fight in front of his adoring home city as he meets Jelbirt Gomera for the WBC International super-bantamweight crown. And his trainer Booth is glad to get his fighter back to business. 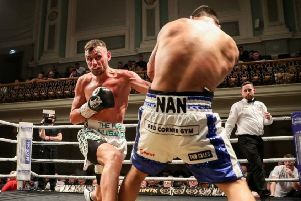 “Myself and MTK Global have a plan to get Ryan back to where he should be, which is world champion status. MTK Global Professional Development Coordinator Jamie Conlan added: “This is just fantastic news for everyone concerned. “We’re delighted to be welcoming Ryan and Adam to another huge event in Belfast. Already confirmed to be joining Burnett are Declan Geraghty and Belfast’s Marco McCullough, who will contest the IBF European super-featherweight title.